Former Bharatiya Janata Party minister and MLA Dr Suresh Amonkar has said that the real BJP today is the Goa Suraksha Manch and it would win the next Assembly election. He formally joined the GSM yesterday in the presence of party leaders as well as leaders of the Bharatiya Bhasha Suraksha Manch. Dr Amonkar was elected from today’s Sankhli constituency on BJP ticket in 1999 and 2002 elections. He was also Goa’s health minister. After losing 2007 election to the Congress, he revolted against the party in 2012, but lost as an independent. He has now formally joined the Goa Suraksha Manch, which is formed by the rebel RSS leaders and activists. 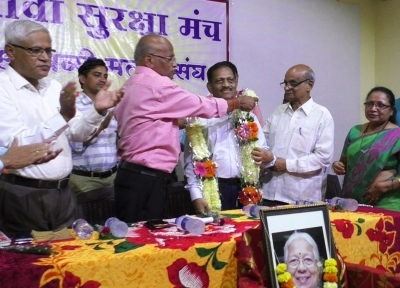 The function held in Sankhli to welcome him was also attended by rebel RSS leaders Subhash Velingkar and Subhash Desai. “My revolt against the BJP was not understood by the people. But today it is recognised”, he said. He also claimed that the GSM is the real BJP, which he always stood for, based on principles. Anand Shirodkar, the GSM president, said they have 10,000 committed RSS cadres with them who had brought the BJP to the victory point in 2012. “With these cadres, I am confident that that GSM would defeat the BJP and bring our party to power”, said Shirodkar. Dotorbaab, having you given up on science and medicine...? or you hope to pump some vitamins into the BBSM? They definitely need it.